Season the chicken. 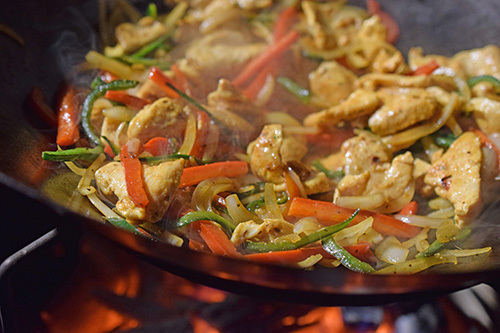 Slicing up the chicken stir fry style (1" x 2" x 1/4") means it marinates quickly. 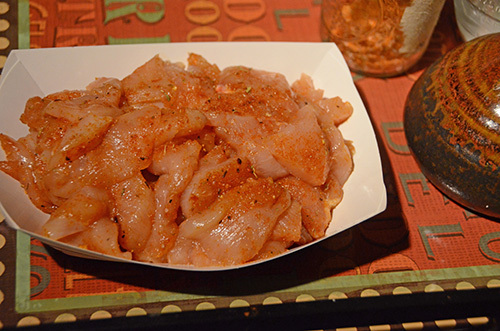 Season the sliced chicken on all sides with 2 teaspoons Cajun seasoning and 1 teaspoon Kosher salt. Allow resting at room temperature for 30 minutes before starting to cook. Prepare your cooking area. Preheat your grill to 400°f and let it get stable. 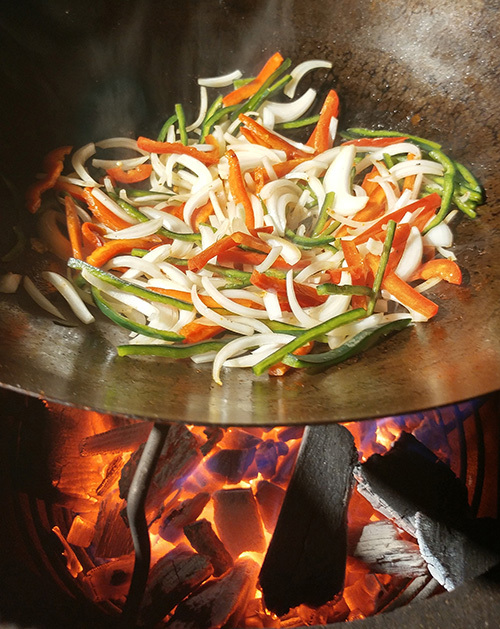 Put your wok on the grill or on your burner about 5 minutes before starting to cook. Flavor your oil. Add the oil to the wok and since the wok is preheated, the oil should be hot in less than 1 minute. 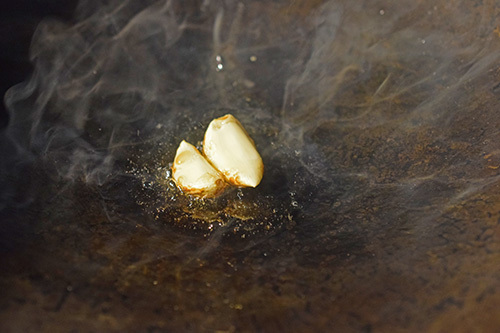 Add the whole cloves of garlic to the oil and allow it to cook, stirring once or twice, until golden brown, about 30 seconds to 1 minute. Remove garlic from oil and reserve. Stir-fry the chicken. Add the chicken to the oil and toss to coat. Stir-fry until the chicken is no longer pink, about 3 minutes. Remember, this is stir-fry, your food should never sit still for more than 10 or 15 seconds. Remove chicken and juices to a plate. Stir-fry the vegetables. Add 1-2 more tablespoons of oil to the wok and give it 30 seconds. Quickly either smash or chop the garlic from earlier. Add the veggies and garlic to the wok, season with 1/2 teaspoon of salt and 1/2 teaspoon of pepper. Stir-fry until tender, 3-5 minutes. Return the chicken & juices to the wok. 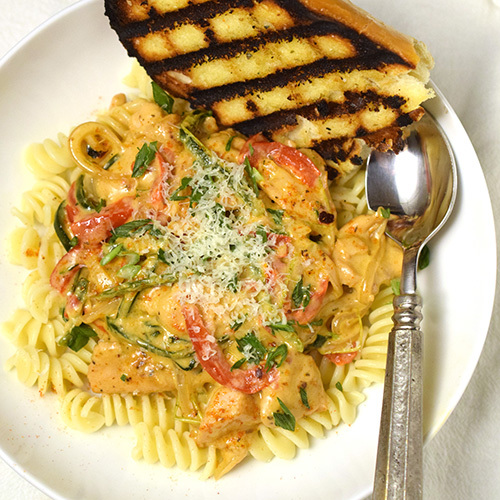 Season with the remaining teaspoon of Cajun seasoning, 1 teaspoon of lemon pepper seasoning, Cook another 2 minutes. Make the Sauce. Add the heavy cream to the wok and toss to coat everything. Allow the sauce to simmer for 3-5 minutes. Then whisk in the slurry and allow to cook until thickened, another minute or so. 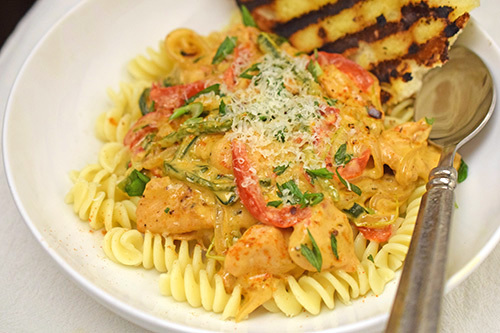 Serve the chicken over the pasta. 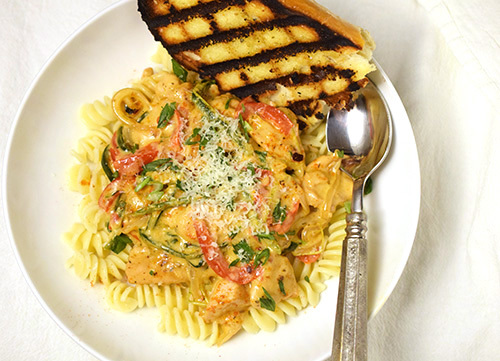 Garnish with finely chopped green onion and fresh grated Pecorino-Romano cheese. Poblano chile - If you don't like spicy foods, you can substitute green bell pepper for the poblano. That would be more in line with Cajun food anyway, I just wanted the heat. Grilling - Cooking on a wok in a kamado grill is a slight challenge because you are used to the air-tight efficiency of a kamado grill. Frequently opening the grill will cause the cooking temperatures to rise while cooking. Since it's a short cook, it doesn't matter as much but here are a few things I do to control/offset it. Preheat the grill to about 50°f less than I plan on cooking and give it plenty of time to get stable at that temp. Keep the grill lid closed as much as possible. You have to open it a lot, be brief about it. Keep the lower vent narrowly open while cooking. I even close it all of the way if I have to have the dome lid open for a minute. Just remember to burp your kamado before opening each time. My set up for wokking on one of our kamado grills is an inverted spider rig, that metal frame you see inside the grill. I normally use it flipped from this position with a 14" pizza stone on it to serve as a heat deflector (instead of a plate setter/conveggtor). But it doubles as a wok stand. I borrowed this technique from stir-frying. Flavor your oil by frying your aromatics at the beginning. Slicing the chicken into 1" x 2" x 1/4" pieces makes it season and cook quickly. 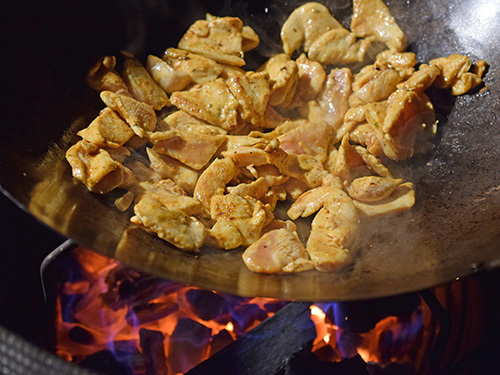 The stir-fry technique means high cooking temps and constant motion. I use a pair of wooden stir-fry tools and do a "scrape and lift" type stir every 10-15 seconds. 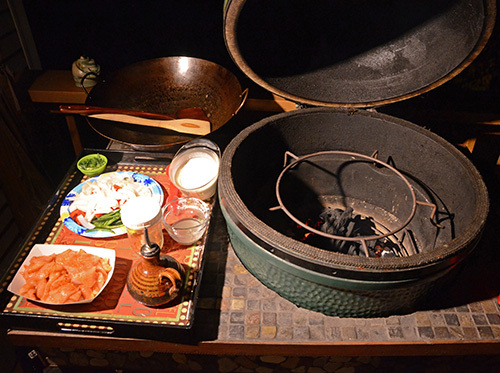 You can see my Kick Ash Basket holding the glowing red coals below. I bought them for all of my kamado grills because of the improved airflow and easier cleaning. I swear this would be good enough to eat by itself at this point, but the cream sauce takes it over the top. 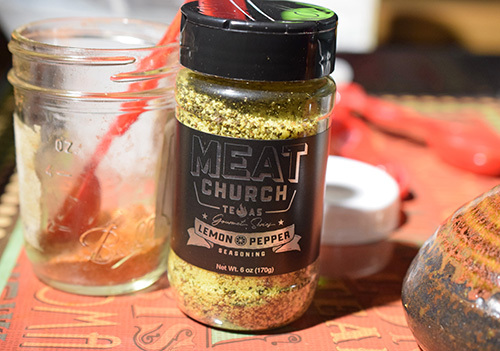 I received some of Meat Church's new gourmet seasonings to try out and used the Lemon Pepper Seasoning in this recipe. 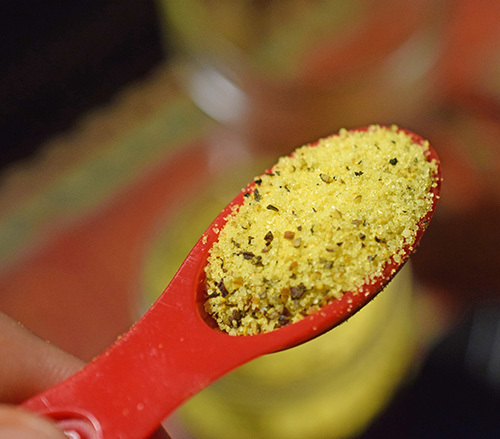 Meat Church's Lemon Pepper Seasoning tastes as bright as it looks, there's a lot more than just lemon and pepper going on here. It's bright citrus profile also is slightly salty, has a hint of sweet, and finishes with peppers and spices. It's a good general purpose seasoning in the kitchen or on the patio/deck. Everything about this made my mouth happy. I think it would also be good over rice or stoneground grits.